Very cool ice skating rabbit! I would love to know what her armature is made out of: cardboard, wood, wire? And is she as big as she looks? The armature is made of two types of wire. she is bigger I like working bigger. If I did it again I think I would use a wooden rod at lest on the l one she is balancing on Because in the long run I think it would hold up better. She is Ice skating I wanted to make a rabbit after I saw The rabbit you made in that was dancing but I have a friend and her girl ice skates so I made a rabbit skating. I don’t know how I missed those skates! What a great idea. Is it going to be a gift for your young friend? 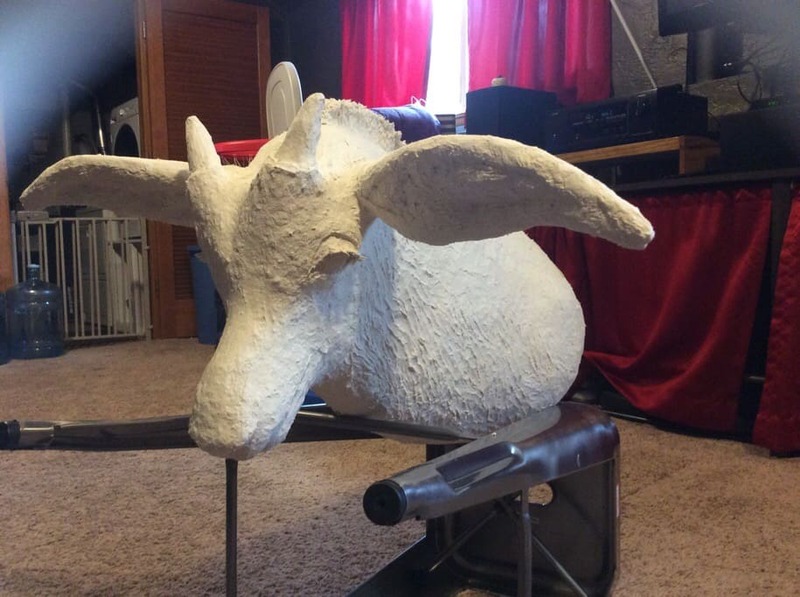 Hi all, I’m almost ready to paint my life sized Roan antelope, and would like some input. It’s 8lbs ( sure thought it felt like more!) and is top/front heavy, so I’m not sure how to hang it. I was thinking of cutting two holes on either side and using L brackets? Johnny, I think I saw a video where you had this problem with a giraffe ‘mount’. Also, should I sand the clay on the face and backs of ears, or do you think the bumpy rough look works? And one more thing, has anybody ever tried burning out the paper and cardboard from a sculpture to make it lighter? I don’t know how flammable (or toxic) the clay ingredients are, just curios, LOL! Hi Cassie. I love the texture, myself – but do what your instincts tell you is right. You know best. He looks fantastic, by the way – he’s going to be a real treasure. Is it not possible to reach in and pull out the paper and cardboard? I know the paper mache clay doesn’t smell very good if you put it in the oven to dry at a temperature that’s too high. In addition to the fumes, I’d worry about his skin cracking in the heat. I can’t wait to see him when he’s painted. I think I remember the comment you’re referring to – Barbara, one of our readers, had a problem with a front-heavy giraffe, but I think she ended up putting him on a table or the floor. If your antelope is hung on a hanger that’s attached near the top of his neck, shouldn’t the weight of his nose push the bottom of his neck against the wall, rather than pulling the entire head off the nail? Before doing any major construction, you might want to just test it. Does he have a flat back or is it open at the back? If the back is flat, you could drill a hole near the top of the neck on the back and hang it over a nail to see if it holds. but maybe one of our other readers will have a more useful suggestion… Anyone? I watch the “monster man” on YouTube. He cuts open his creation when it is completely dry and pulls out the stuffing. The stuffing is usually rolled up papers. Then he tapes it up and maches the scar. After that he puts the textures and details. You could open the back and do the same. Well, it looks like you are on your way to “I’ve done a great job again.” It is an amazing sculpture. I have been making piggy banks since before I began using paper mache clay. I am just finishing up a hippo piggy bank. I cut the sculpture in half (and I’m not suggesting you do any such thing on this one, but the back must open somewhere, I say!) and then I pull out everything inside. The process is a little tedious, but the sculpture is MUCH lighter. I would definitely take out the insides. Even if you have to repair the back. The clay is plenty strong to hold it together. I don’t know if you saw the three paper mache leprechaun-pumpkins I made with my friend Mary last fall, but they were about 9″ tall. After removing the paper inside, they weighed about a pound each. 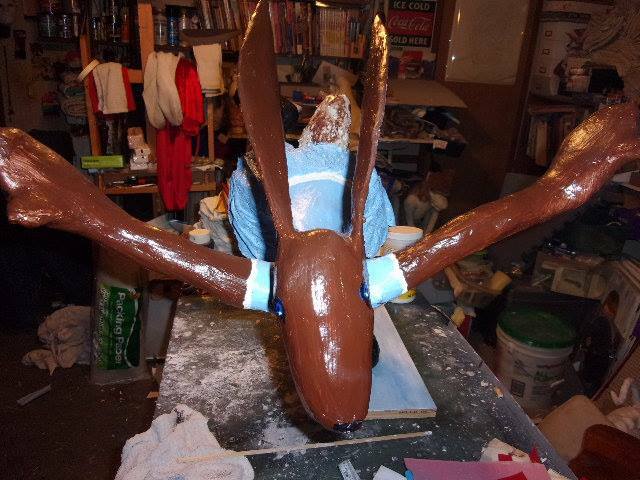 I might consider sanding the horns and perhaps the back of the ears, but I think what you have is really nice. This is really nice, and I can’t wait to see it painted. You do incredible things. By the way, I usually use a pair of pliers to twist the paper and cardboard out, and a pair of plumber pliers is my favorite tool because of the long handle and the adjustable mouth. Good luck. Oh my goodness, those are really cute leprechauns, Rex! Thank you very much for the compliment and the tips. I have stated painting it, but have a ways to go. I was concerned with how difficult it would be to get the paper and tape off the cardboard armature without damaging the clay shell, so I chickened out and left it. But I think I’ll try it next time. And I hadn’t even thought about the clay cracking if I tried burning it out, so I’ll save my fire bug urges for something else. Great tips and input from this group, thank you! Hi Lesley. I do it the easy way – I drill or cut a hole in the cardboard back and hang it over a nail. Or I use epoxy glue and attach the flat back to a wooden plaque. I hope you’ll let us see your gear when it’s done. We’d love to see it! Okay well that sounds simple enough! Perfect! Thank you Jonni. I want to share my project. A family members pet that passed on. Hope the pic comes through this time. Hi Jamie – it didn’t work, I’m afraid. Is the image file size less than 250 kb? Larger images won’t come through – and some people have had problems uploading from iPhones. First paper mache clay mice Christmas ornaments thank you for all you share it makes creating so much fun thank you ! Hi Patty. Your image didn’t come through. Do you know how big the file size is? Photos need to be less than 250 kb to upload to the site. I hope you’ll edit the photo and try again, because we’d love to see those mice. What a great idea for Christmas ornaments! My books have just arrived: ‘How to make tiny paper mache dogs’ and ‘Make animal sculptures’. As yet I have not started trying to make them, but I was considering putting each on a plinth/base, after they are made. 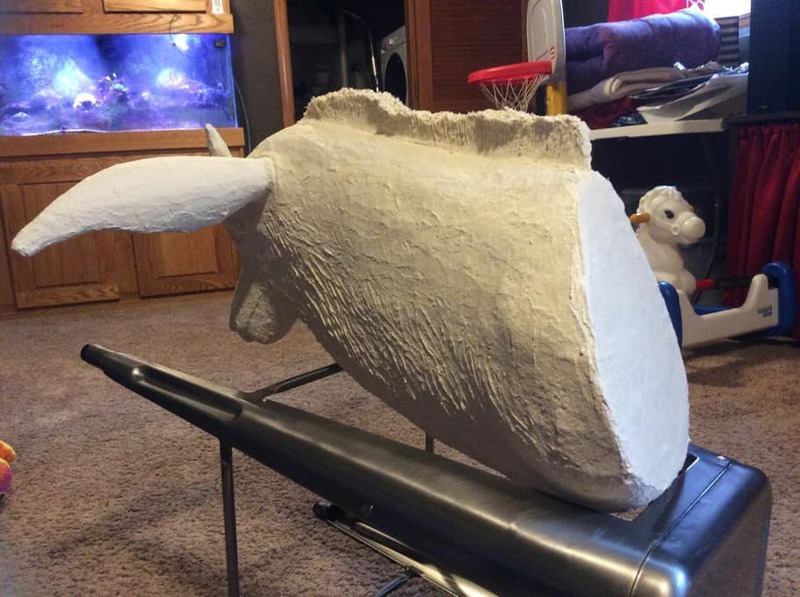 Does anybody make a paper mache base to stand their completed pieces on? Or just buy a ready made base or make your own with timber. 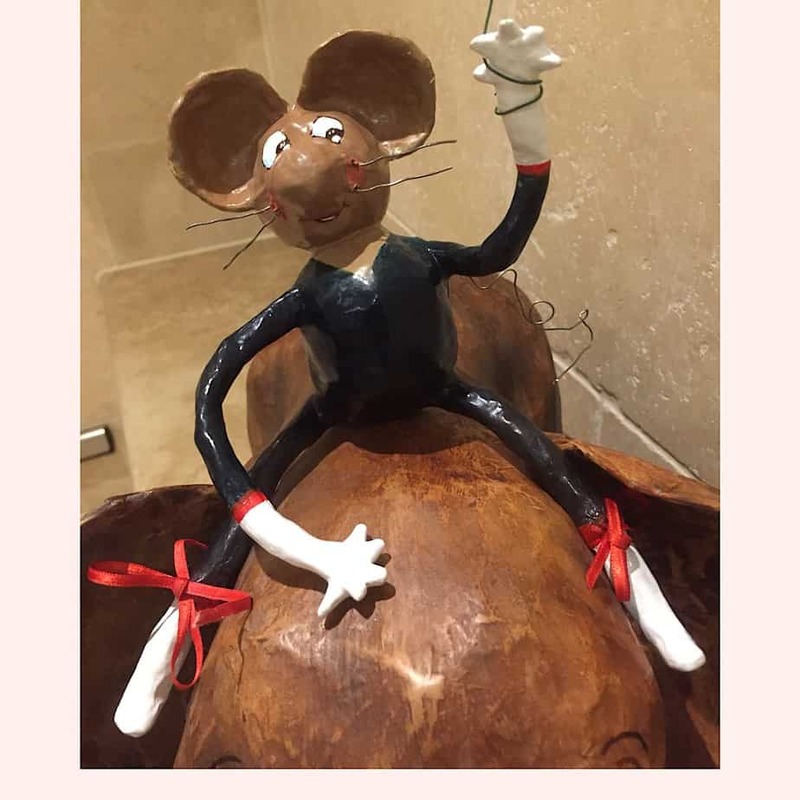 If you make your own from paper mache or clay, it would be interesting to see the end result and perhaps share the process of how it was made. Hi Linda. That’s an interesting idea! It would be fairly easy to do if you want a round base, because you could use an oatmeal box or a plastic bucket for the armature, and add decorations to it. If you want one that’s square or rectangular, that would be a lot more challenging, because flat cardboard tends to warp when paper mache dries. Now that you mention this idea, I’m really hoping some folks share their ideas for displaying paper mache sculptures on a hand-made base. It’s a great idea. Hi, I have had good success with using styrofoam covered with paper mache clay. It doesn’t shrink or warp and it is quite sturdy. I have also used cheap wood covered with clay if for some reason I needed it to be heavier. Most of my bases are made out of wood if they are intended to go to an art show, it gives a more professional look that buyers are interested in. I found a wood turner at a local craft show who makes my bases because I was spending too much time doing the bases and I wanted to get back to sculpting. Good luck and make sure you post your results as we always love to see other’s work! I was wondering about the time and skill required to make wooden bases. I think I would need to look for a wood turner, if I want something professional. That is a great idea, Eileen. 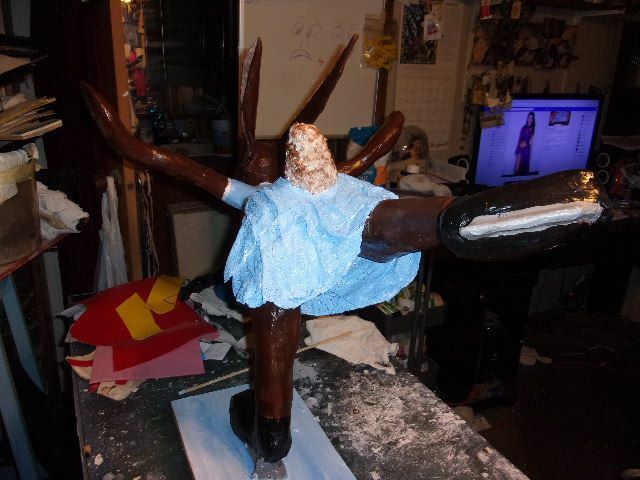 Hi Jonni, this is the sculpture I’m working on. Can’t seem to find that magic color ginger/ light brown. This is my sculpture I’m having trouble with finding the magic ginger color. If it’s going to look like the original dog, the color should be near exact I think. Hi Jonni, love your YouTube videos, they’re the best on the internet. Very informative. My question is how do you mix/layer paint to make that light golden brown like on your lion without ending up with mustard? I need a light brown slightly ginger. 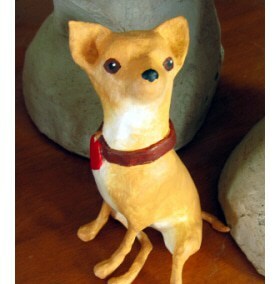 I’m making a paper clay dog sculpture memento. Hi Jamie. The photo of your sculpture didn’t come through. The file size was probably too big – it needs to be less than 250 kb. As for the color, you might want to watch my daughter’s video showing us how she mixed several different colors, from tan to dark brown, using a limited palette. Getting the exact proportions right takes a lot of experimenting, of course. Good luck with it! 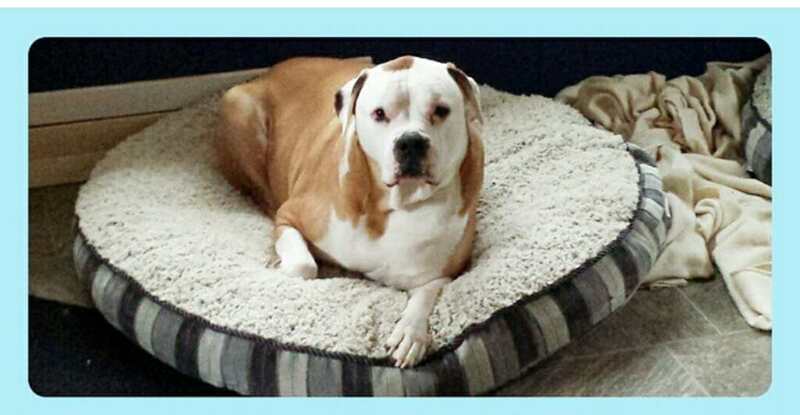 Yes, before I even read your post, I looked at the dog and thought of Jesse’s coloring tips. I have an unpainted dog (a memento, also), and I want to try it. Please let us see how it turn out. Couldn’t I just curl up next to the dog? What a gorgeous face. I have a question I hope someone can answer. I’m trying to put together a fairy tree. I have cut out a few hundred leaves (as in the photo) and glued wire onto the watercolor paper leaves. I taped them all down with masking tape and then pulled off the masking tape. Three of the leaves and wires separated (as the leaf on the right). Does anyone know if the hot glue I used will keep the wire on the paper? Will the wire rust without being covered with tape? Any suggestions on what I ought to do next? I wanted to paint the paper, but I’m afraid I ought to cover the wire with masking tape and then add paper mache clay, which would be a totally different project. Any comments. I’d really like to know the answer, too. Rhonda, thanks beyond words. I’m printing out that glue guide now. It is much better to find out at this point than to be fixing hundreds of different leaves that are falling off. I will use the glue recommended. I appreciate this so much. Rex, I have made 2 different types of leaves. One were long and spiked and I wanted them to curve so I used 2 strips of news paper, wire in between and they were held together with paper mache paste and left to dry. It worked fine, no rust because it dried so fast. Second, I rolled out a thin layer of Jonni’s smooth clay between 2 pieces of wax paper and let them stiffen just a bit so they didn’t stick to the wax paper. Then I imbedded the wire into the clay just until I couldn’t see the wire. This worked but they were a bit fragile and you could see the wire. Couldn’t you use aluminum wire? I don’t think it is supposed to rust. Eileen, thanks again. I will have to go to the hardware store and check if they have aluminum wire. That would relieve many issues. I may have to take my watercolor-paper leaves and rethink that. The second piggy bank I ever made looked like watercolor, so I was thinking of the leaves as yellow-orange-green, but I’m sure paper mache clay would be just as easy to paint, so I’ve gone back to the drawing board. I appreciate your input a lot. You are welcome Rex, and good luck with all the cutting of the wire and leaves. It sounds like an ambitious project. I often have these ideas that seem to snowball right in front of my eyes! If you wind up not using your watercolor paper leaves, save them and use them like Jonni uses the tissue paper for a kind of deco art look on a simple sculpture. That would be cool. Make sure you post this tree when you are done. 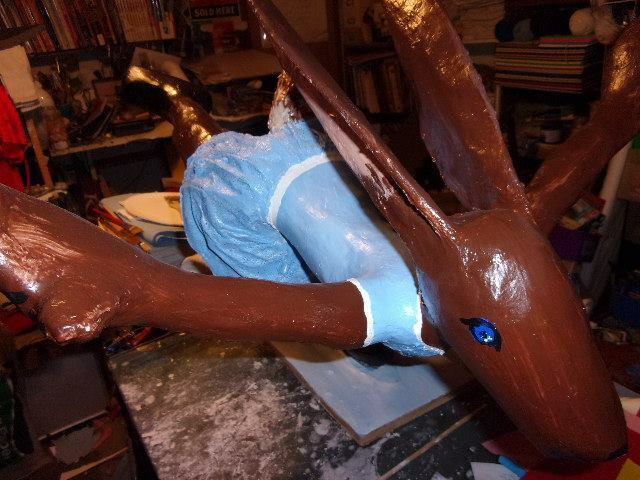 His is my first papier mache project. 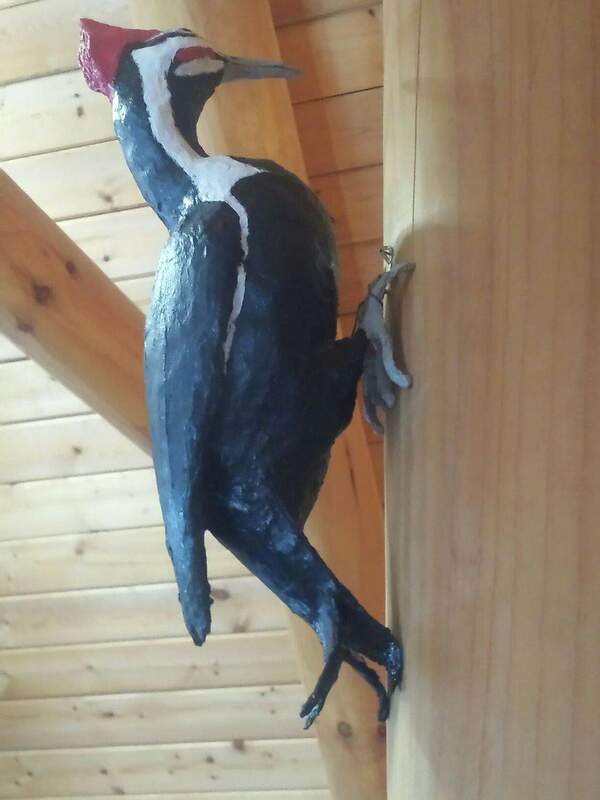 We own a log home and have Pileated Woodpeckers in our woods. I waned one for he big center post inside the house! Fat fingers! That was supposed to be This is . . . I wanted one for the big . . .! Here is my second project ? Geez, that was supposed to be an exclamation point not a question mark. Jonni, you need to give me a way to edit! 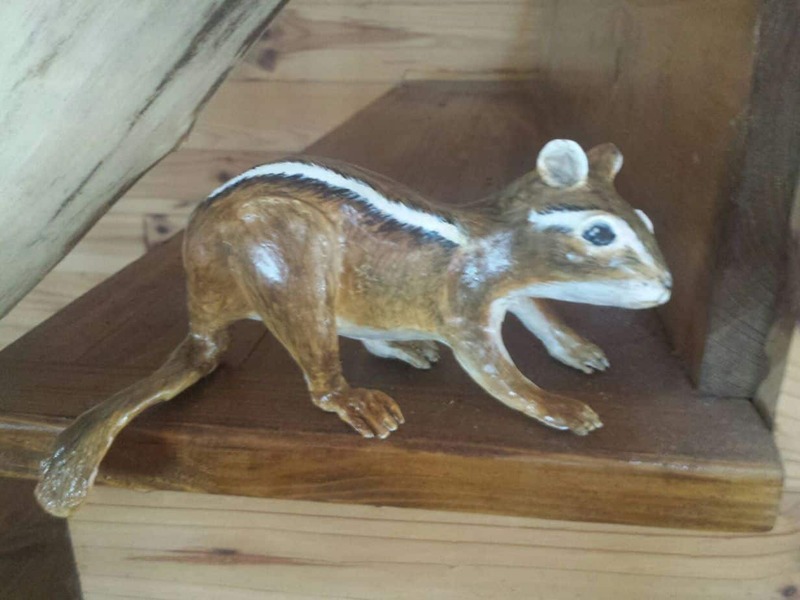 Great chipmunk, Linda. How big is he? He is lifesize as is the woodpecker ? Linda, what a triumph for your first paper mache project! Very impressive. They are comical fellows aren’t they? First project? Wow. I love him and the chipmunk. I would definitely put one of these somewhere on my walls. I see a woodpecker around here maybe once or twice a year. To have one on the wall like this would be really special. Great job. It’s a terrific, creative idea. I love his feet and how you anchored him against the log. Linda, I came back to look at him again. That is beyond cool. Here is a silly little project I just finished. My daughter is having a surprise birthday party for her husband and wanted a pinata for the kids that would be coming. 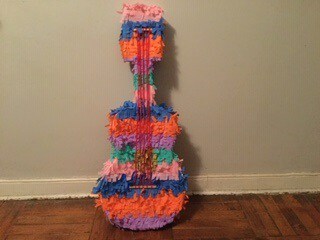 He happens to be a fabulous guitarist so I chose to make a guitar pinata. I made the guitar out of lightweight cardboard covered with one layer of paper mache. Then painted it white and started glueing the crepe paper onto it using plain old Elmers glue. Then added the strings with yarn and it’s done. Easy but a bit tedious to glue the strips on. Not my best work so I dont mind that it will be smashed up! Eileen, the kids are going to love it! And so will your son-in-law, I’m sure. Sticking the crepe paper on it must have taken hours! Yeah, the. Crepe paper strips were tedious but not hard. I would cut off chunks about 10 “ long, cut them with 3/4 strips and then apply row by row. I did the front one night, then the sides and back the second night. My daughter is thrilled and does not want it smashed. I told her to get over it! Rex, I am not a hippy but my daughter and son in law are! I love the guitar. (Are you a hippy? ex-hippy?) It is very colorful. I think at times our “silly” ideas actually turn out to be the better ones. Well hello Jonni – one of my favorite artists – I want to make a skull form the way you did – Please tell me how to order the skull you used and tell me how you put the clay over it avoiding the holes, etc. This will be so I can duplicate your skull form with the silacone and plaster cloth, etc thanks. Hi Joanne. It’s good to hear from you again. I bought my skull from amazon.com. But I only made the forms because the skull rolls around on the table when I only want to make a face mask, and I got tired of trying to prop it up. However, I’ve used the skull itself several times as a mask for without going to the trouble of making the castings, and it works great. That’s how I made the portrait mask of the Hunchback of Notre Dame. The skull itself is fairly expensive, so you probably don’t want to buy the silicone, too, if you don’t really need multiple mask forms. I just filled in the holes with clay so the paper mache mask won’t get caught behind the jaw bone. then you can start casting with more plaster gauze in the rubber mold? Yes Jonni – I love making masks – and have been stuck making forms from my own face by putting the plaster strips directly on my face – I am getting too old for this risky procedure and agree that yours is a preferred method. Thank Jonni. Wonderful hearing from you. I wouldn’t want to put the plaster cloth on my own face, either. Have you tried one of the plastic mask forms from amazon? They’re pretty cheap, and less expensive than making a form yourself because of the cost of the silicone. That’s what I used for all the masks in my mask book. I love your elephant and friend. Great sculpting and beautiful painting Could you tell me the size. I can visualize better if I know how big they are. Thank you Joyce, much appreciated! 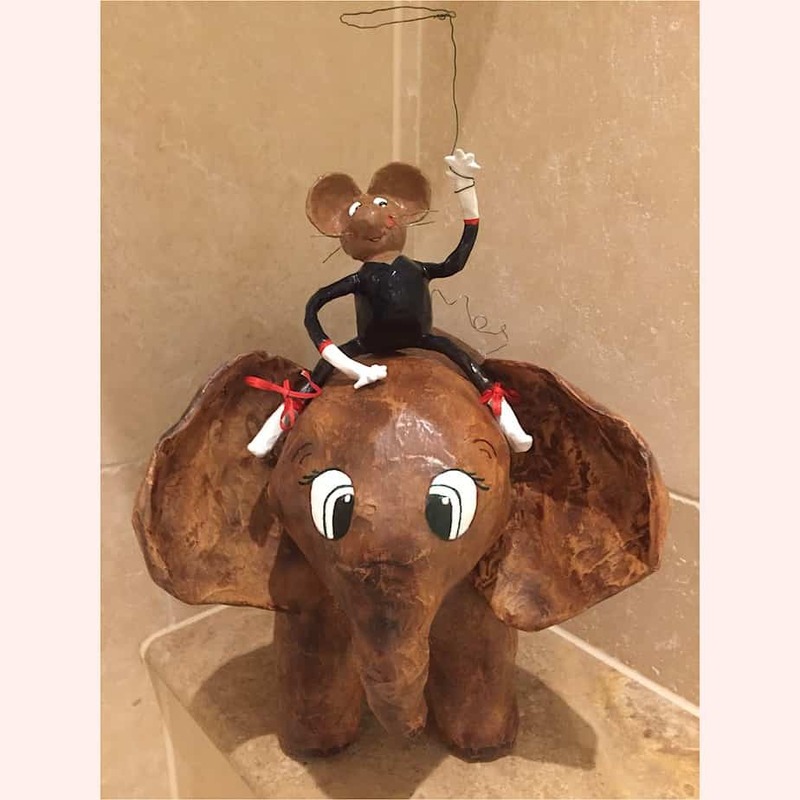 The elephant is 35x28cm and the mouse is 15x18cm. I guess in inches that would be approx. 14×11 and 6×7. Hi fellow sculptors, herewith some pictures of my new project. 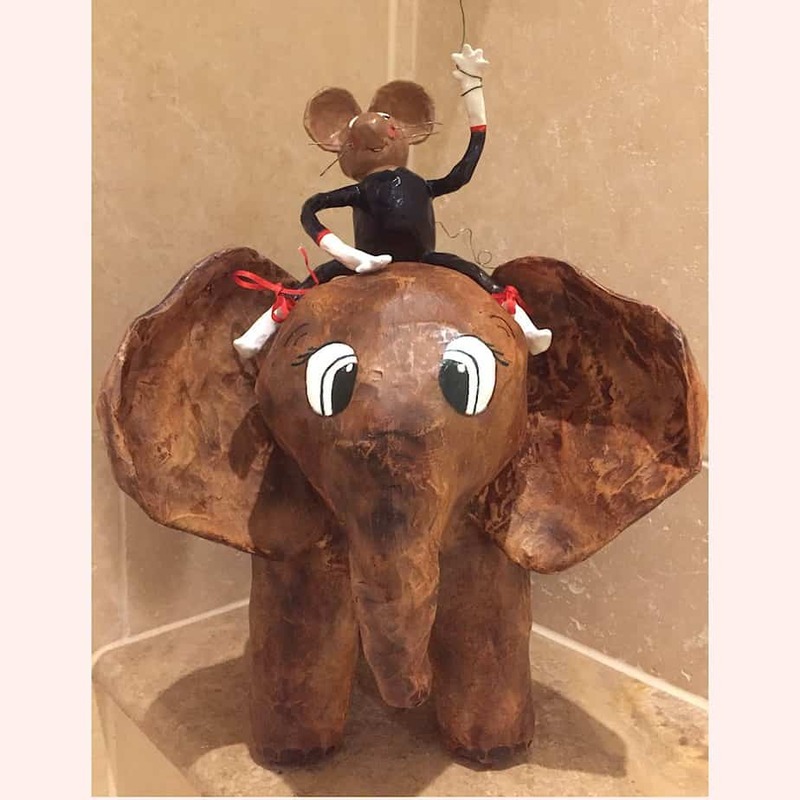 (Making a good photo is even harder than making a sculpture:-) Both the mouse and elephant are made with paperstrips, followed by 3 layers of gesso. I painted both with an airbrush and some parts with a brush. I espacially like the elephants skin. The underlayer is painted grey with an airbrush, then I sand-papered it slightly. The last brown layer I applied with a sponge and removed it again with paper towels. It almost looks like bronze, really nice. It does look like bronze – the finish on your elephant is really nice. And the way you did it is unique. Thank you so much for sharing them. And by the way, Joyce would like to know how big they are. Her comment is here.